Arsenal legend Ray Parlour believes Unai Emery should be keeping Aaron Ramsey at the club instead of Mesut Ozil after the win over Tottenham. Ramsey is out of contract at the end of this season and BBC Sport have reported the Wales international will be leaving the Emirates Stadium. This seems slightly bizarre considering Ramsey’s importance to the Gunners down the years, while Ozil was recently handed a new deal. Of course, the German playmaker has his qualities too, though there is a reasonable argument to make about which player is the more consistent, or delivers in the games that matter most. Parlour is unsure about this decision as Ramsey nears a potential free transfer to another top side, with big names from England and Europe sure to be queuing up for what could be one of the best free transfers of next summer. 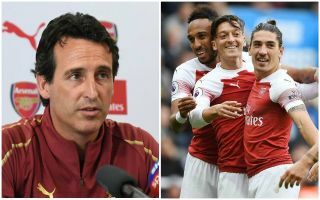 Speaking about the situation on talkSPORT, the former Arsenal midfielder made it clear what he thinks Emery should do, saying: ‘My personal decision would be that I’d rather keep Ramsey than Ozil. ‘I think Aaron brings a little bit to the team. Mesut Ozil is a great player, I’m not doubting that, but you can leave him out. We didn’t miss him yesterday, whereas I thought Ramsey made an impact in the second half. ‘Aaron has been there a long time, he’s been there for ten years, so you’ve got to look that as well. ‘Some players would sulk and say, “I’m leaving at the end of the season, so it doesn’t really matter”, but his attitude has been spot on.